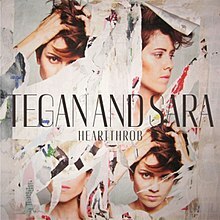 Where Julie Goes, Music Follows: Review: Tegan and Sara "Heartthrob"
Last week-end, I was finally able to listen to Tegan and Sara's latest album "Heartthrob". Although it was released in late January, I didn't get a chance to give it a go 'til now. I've been a casual fan of Tegan and Sara for a few years. However, when I heard the new album's first single, I knew they were onto something with the direction of "Heartthrob". The song entitled "Closer" has been doing very well on the charts and I suspect the duo has gained many new fans due to its success. The themes of this album are quite obvious: love, breakups and relationships. Although these sound generic and possibly boring, we can all relate to them. Many songs on the album stand out for me, including "Goodbye, Goodbye", "I Was A Fool", and "Closer". The sound of this album reminds me of old school Roxette and I love it! However, I do understand why some Tegan and Sara fans are critical of this album. In comparison to their other albums, "Heartthrob" is pure pop music. It is unapologetic, in your face pop with a strong electronic influence (with a hint of the 80's). The album is well produced and the harmonies are fantastic. Overall, I believe this is a strong album for the duo. I can't wait to see these gals live at the Ottawa Bluesfest this summer. In the meantime, check out the video for "Closer", which is fabulous! I love everything about this music video. Enjoy!